Your company’s competitive advantage isn't defined by what’s great about your product or service. It’s all about what makes that product or service better than everyone else’s. That’s not a conclusion you can reach as a matter of personal opinion. Your marketing plan needs to include a method for sizing up what your competitors offer - from the customer's perspective. What Makes Your Business Better? A competitive analysis involves researching those companies that offer products or services similar to yours. They may be competing within the same geographical area, as in the case of a physical office or storefront. Or they may be online competitors, drawing from the same virtual market. Appraising who you’re up against in business helps you clarify the advantages you bring to the market. Studying the competition also allows you to figure out exactly who would gain from the benefits you offer. And a competitive analysis is a great way to determine how to deliver those benefits to customers in a way your competitors don’t. Examining where and how other companies have achieved their success – as well as any gaps in their tactics – will better position your business to pivot. That means taking what you learn from your research and adjusting your original business plan as needed. Analyzing the competition not only reveals opportunities you can leverage to meet the needs of more customers, it exposes potential flaws and limitations within your own business processes. Remember, the better you understand what your competitors are doing right or wrong, the more effective your marketing initiatives will be. Attracting new and repeat clients is all about providing value to your buyers. What are other businesses doing to encourage customers to shop with them? Do they offer lower prices, better-quality products, a more convenient sales process, a no-hassle return policy, broad-based availability? Investigating the online and print ads, promotional events, and social media channels utilized by your competitors can tell you a lot about them. Particularly important is who these companies are marketing to, how they’re reaching their audience, and what their clients are saying. By comparing advertising techniques and target groups, you may discover an underserved market segment or a distribution channel you hadn’t thought of before. 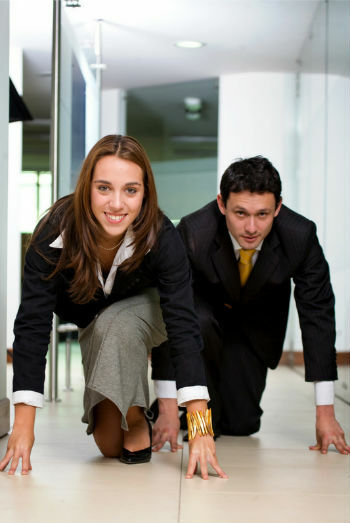 Maintaining your competitive advantage is just as important as establishing it in the first place. Hundreds of thousands of new businesses enter the US market every year. In fact, the most recent statistics from the Department of Labor confirm that something like 888,000 businesses were born in 2014 alone! Keeping a finger on the pulse of your market should form a part of your long-term business strategy. What gives your organization an edge over others today, may not be the case tomorrow. Especially if yours is a lucrative industry with relatively few barriers to entry. prevent your business from being blind-sided by that startup down the street! With half of all businesses failing at some point during their first five years, the success of your venture requires more than a winning idea and an enthusiastic mindset. A good business model, followed by the right research and planning, are key. So make a point of learning from other companies who have walked the same path, and put more of the odds in your favor.